A lush, garden outdoor family room replaces an unused entry patio. Imagine coming home to an inviting outdoor family room like this? Why go indoors at all when you can enjoy an outdoor family room with fireplace, sitting areas, fountain and water garden and more! Before- The patio served as a “catch all” area for bikes, toys and dead plants! Think “outside of the box “when creating usableÂ garden roomsÂ in your yard. 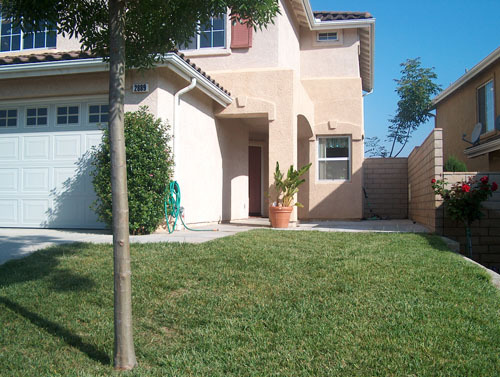 Don’t overlook your front-yard or often ignored side yard Â as a site for a destination area either. Michael and Shirley relax after a whirlwind two days making over a patio entry area. This is exactly what landscape designer, Michael Glassman and I did on our show, “Garden Police”when we transformed an unusedÂ concrete entry patio into an outdoor familyÂ room. First, we separated the new”family room”Â from the lawn area and created a sense of enclosure with aÂ simpleÂ “translucent” wood postÂ fenceÂ detailed with copper wire. 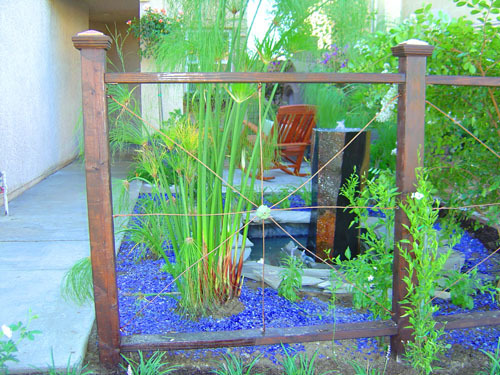 Simple wood fence built with 4 x 4 wood posts, heavy gauge copper wire and an antique medallion for detail. Not all fences are solid! The antique medallion was from my partner, Michael Glassman’s private stash! 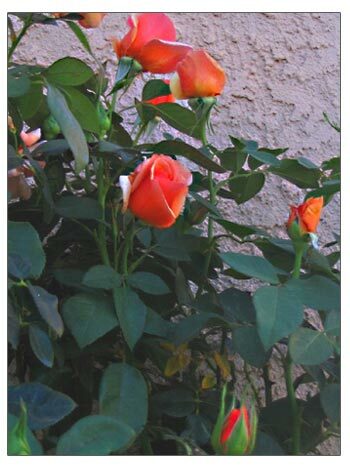 An illusion of separation is all you need sometimes to mark a transition to another space in the Â yard. 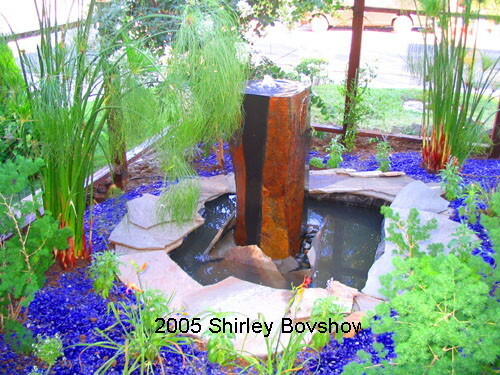 Next, we installed Â a basalt fountain and Â surrounding “water garden” to Â serve as a focal point for the family room. 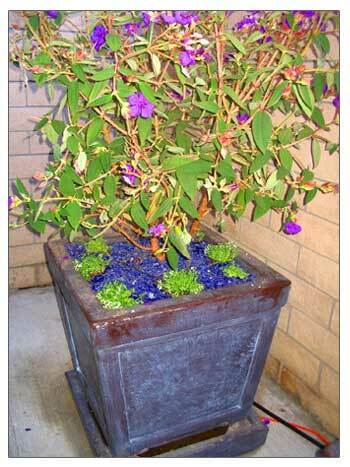 Plants includeÂ papyrus, asparagus fern, daylily, topped with cobalt blue tumbled glass. This is Â our impressionistic version of a bog. The patio was furnished withÂ one style of Â garden container in different sizes for continuity and Â with varied Â plantings. When planters are uniform in style, they tends to look as though they are a part of the architecture of your home, Â as a site planter. 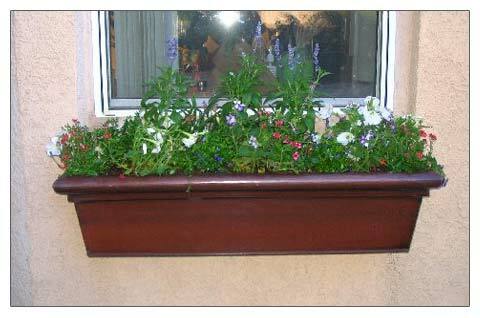 Select one style of planter when you want to make a design statement. The cinder-block walls were softened with over sized plantings of Japanese privet and Tibouchina or “Princess Flower” planted directly in front of them. Drip irrigation supplies the water. If you analyze the design, you will notice that many of the makeover elements are “ready made” or Â can be bought at your local garden center. The only design element that was custom made was the wood and copper wire fence. You can construct that yourself! 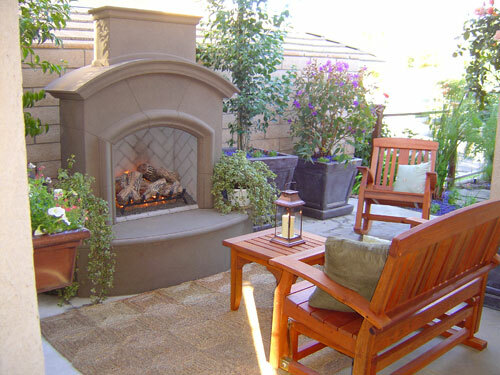 A complete patio makeover like this can be easily replicated if you have a small patio with access to the house. Coral-colored, Â “Nancy Reagan” rose contrasts nicely with the purple flowers of the Tibouchina. We detailed the window with a copper window-box to marry the architecture of the house with the garden. Prefabricated fireplaces like this one by Designs by Gary, make hearth-side relaxation a reality in less than an Â hour! Opposite view of the new outdoor family room! Furnish your outdoor family room with a rocking chair. This one from Restoration Hardware. Go outside and take a look at your wasted spaces and consider Â the possibilities! For more details on this outdoor family room makeover, read the episode recap on my web site and look for the Garden Police show on the Discovery Home Channel! If you enjoyed this blog post,Â Create A “Garden Family Room” From Wasted Space, please share it with your friends on Facebook and Twitter by using the share buttons below! I’d love to answer your Â landscape design questions so please leave a comment below! Thanks for your nice comment. Is this your first time visiting my blog? I’m with you, I love bold color! Nice job, Shirley & Michael! Sometimes we have space for something nicer, but we just don’t realize it. You have done a great job of visualizing the possibilities for this homeowner. 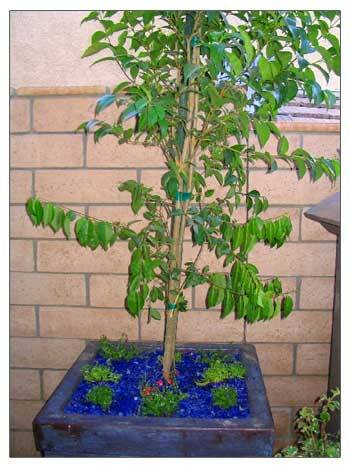 Nice choices of plants and being a fan of color, I love the cobalt glass touches! Yes, we removed a large portion of the grasss that grew up to the concrete patio and created a water garden with basalt stone fountain. The family really uses this outdoor garden room now as their living room is tiny! Beautiful Shirley! Did you tear out the grass? Welcome back buddies! I’m glad you like the garden room. “Thanks” on behalf of Michael and yours truly. Wow Shirley, what a great transformation, from blah to pow! This is wonderful Shirley. I have a morning room just off my kitchen on the front side of my house. It has an entry and will be a focal point. I got some good ideas from you for this spot. I’m calling it a courtyard. I love your use of bold colors and that fireplace really made it an outdoor room. The blue rock makes it seem like it’s surrounded by water. It’s very peaceful and bold at the same time. Very nice! Your show on Discovery Home is doing well in our area. It’s part of a premium package and I’ll be getting it at my new place. I can’t wait. For now, I have to watch you on the puter and it’s just not as pretty. I want to see you on my big screen!!! I want to see those colors pop!